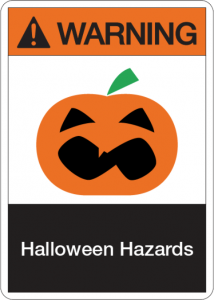 Halloween Hazards: How to keep calamity out of your fiendish festivities! Halloween is my favorite time of year. The weather has finally turned crisp. The leaves have either started turning colors or are already littering our yards. Minds begin to shift to what adorable or ghoulish costume they’ll put together. Then of course, there are people like myself, who begin thinking of how to make the neighborhood kids so scared they drop their candy buckets. Most of us know basic Halloween safety, but here are a few things you may not have considered. Dried flowers, cornstalks, crepe paper and fake cobwebs can catch fire easily. Make sure all decorations are away from open flames or other heat sources like light bulbs and heaters. Don’t drape fabrics over light bulbs. It may create a spooky ambiance, but can also cause a fire. Verify that all props that are hanging, dangling, draped, or staked are steadily secured. If there will be foot traffic, tape down loose wires with duct tape. This will limit tripping hazards. Plan to make sure that the tape is still secured throughout the evening. Make sure all smoke alarms in the home are working and have fresh batteries! Well placed lighting can cast sinister shadows, but make sure that your walkway is well-lit. If you use a fog machine, make sure the fog is thin enough so your visitors will be able to see any potential tripping hazards. Speaking of fog machines, no one will tell you that they aren’t awesome. But they should be used sparingly and not in enclosed areas. Some guests may suffer from breathing ailments such as asthma. Make sure there is ventilation wherever you use one. When plugging in decorations, avoid daisy-chaining extension cords (plugging one into another), which may cause overheating or overload electrical outlets. Plug all outdoor lights and decorations into ground-fault circuit interrupters (GFCIs) to help reduce the risk of electric shock. Portable GFCIs for outdoor use can be purchased where electrical supplies are sold. Never staple, nail through, or fasten electrical wires or extension cords in any way that might damage the wire or insulation. This could cause electrical shock or fire. Remember to keep exits clear of decorations, so nothing blocks escape routes in case of danger or terror! They started off as carved gourds in Ireland in the 19th century, but thanks to Washington Irving’s short story, “The Legend of Sleepy Hollow,” they shifted to pumpkins. Now, pumpkins are the symbol of Halloween. They are fun to carve, but care should be taken when doing so! It was always a rite of passage to see how many Band-Aids you needed from carving a pumpkin, but these days we’re all a bit smarter. Specific, inexpensive tools are available to hack and slash your jack o’ lantern! Try to use a battery-operated candle or glow-stick in your jack-o’-lantern instead of a real candle. Create your Gourd of Art on newspaper or absorbent paper towels. Scoop the pumpkin seeds and slimy innards into a bowl. This will lessen the amount of pumpkin guts to fall on the floor, and help you to avoid a slipping hazard. Beware of long, trailing fabric. This can cause a tripping hazard for yourself and those around you. When using makeup or face paint, follow all directions carefully. Don’t decorate your face with things that aren’t intended for skin. If you’re using a product you’ve never used before, try a dab of it on your arm for a couple of days to check for an allergic reaction. Even if you don’t know of any allergies, this is a great way to be sure the product hasn’t gone bad! Changing the color of your eyes or even changing the shape of your pupil can have an awesome effect, but beware of cheap contacts and makeup. Test them out before you go out. If you prefer using masks, make sure you have one that allows for unobstructed peripheral vision. Also, make sure you can breathe in your mask. That’s more than a little important. And don’t wear your mask while driving! Test your costume out to make sure you can use the restroom easily! The more complicated the costume, the more you should test it out. Always travel with friends or in a pack. Add reflective tape to your kid’s costume (on the back of their shoes at the very least). If the costume doesn’t allow that, add it to their candy bag. They won’t lose that and will always keep it close! Parents, go through your kids’ candy. There have been very few reports of actual tampering, but it is the best way to get samples of the best candies the kids have collected for yourself! The last bit of advice I will give is to NOT play tricks on folks who don’t give out candy. It’s ok for them to not like Halloween as much as you do like it!